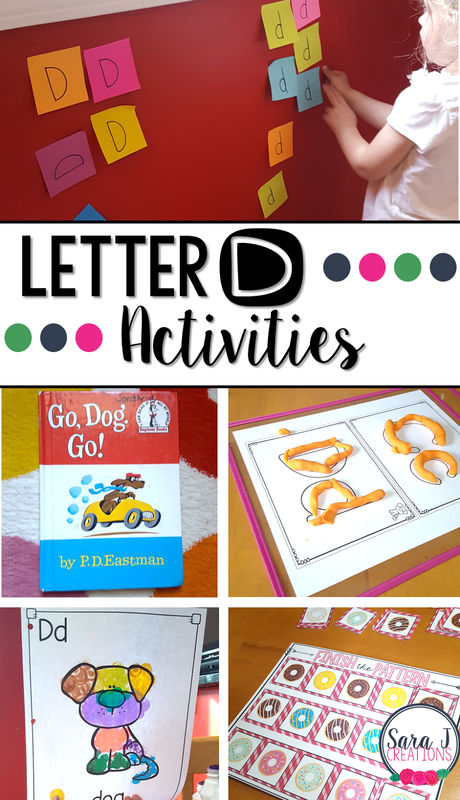 Preview: Letter D Activities that would be perfect for preschool or kindergarten. Sensory, art, fine motor, literacy and alphabet practice all rolled into Letter D fun with some bonus math practice. Up next in our weekly alphabet study is the letter D activities. This week was full of activities that started with the letter D like donuts and dots. We also spent some time reviewing other letters we've learned and building our sensory and fine motor skills. To start our study of the letter D and a week of fun activities, we read the book Go Dog Go! by Dr. Seuss. 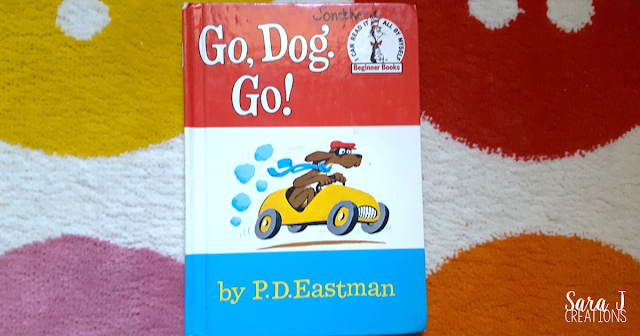 We talked about how the word dog starts with D. Then I showed my daughter what a D looked like in the book and we searched for other D's. I made sure to pick a book that matched the picture that we would create next for our alphabet art book. For the alphabet book we are working on, we added D is for dog. We decided to create a dog made of dots using our bingo markers. I love that this is a skill she can work on independently while I prep for other activities. The alphabet book is part of my Alphabet Centers with Real Pictures. To practice writing the letter D, I put our alphabet tracing sheets in a reusable plastic sleeve and gave her a dry erase marker. She reviewed the letter C and moved on to the letter D. I'm surprised each week that this is one of her favorite parts. She loves tracing the letters and is getting much better at it. For some fine motor practice, we played with playdough and practiced making all of the letters we've learned about so far. The ABC sheets are part of our Alphabet Centers with Real Pictures, I just set them to print 2 per page under the "multiple" option in the pdf print settings. Then I slipped them into our reusable plastic sleeve so that I wouldn't have to laminate them. We used our absolute favorite Koolaid Microwave Playdough recipe. This always smells so good!! I had my daughter roll the dough into "snakes" and then form each letter. Since D is for Donuts, we pulled out some of our donut centers for a little fun. We started with our felt board and felt donuts. You can find directions for making your own felt donuts here as part of our donut shop dramatic play. That way is so much easier than cutting out felt and creating donuts that way. I gave my daughter the donuts and we practiced making upper and lowercase D's out of the donuts. Then she used the donuts to do a sorting activity. She separated them by stripes and sprinkles and then sorted by color. 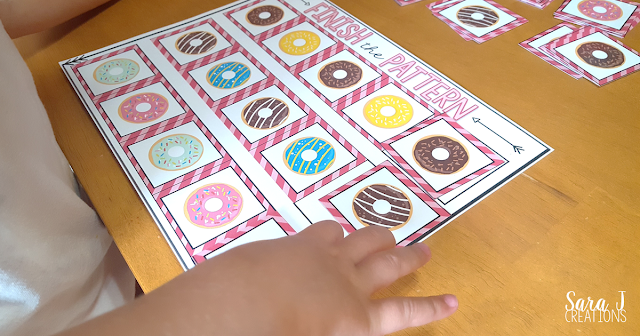 After that, we pulled out our donut pattern sheets to work on AB patterns. I set out all the donut choices for her and then she took the sheet that had 4 donuts starting the pattern and she had to figure out what would come next in the fifth spot. She did a great job with this and we just did it quickly to throw in a little math practice that was related to the letter D.
To get my little one up and moving, I took my new pack of sticky notes and wrote upper and lowercase D's on a bunch of them. Then I stuck them all around our main floor. I stuck one of each letter on the wall in our kitchen. Next, she had to search around the house for the sticky notes, bring it back to the kitchen and sort it on the correct side. She loved this and did it quickly. By the time we got to D she was an expert, because I had a mommy brain moment and set up the activity with the letter B first. She had the whole activity done before I realized that wasn't the letter for the week. #fail But it was good practice! !